Hiroko is a world class chef-instructor. She has taught hundreds of students from all over the world during her 25-year teaching career. Hiroko wants to share all of her knowledge with her students. Hiroko teaches frequently at International Culinary Center (ICC), New York City (www.internationalculinarycenter.com). Hiroko also teaches as an instructor at other cooking schools and organizations in the US and around the world. Wherever she meets students she conveys her love of teaching to new audiences. 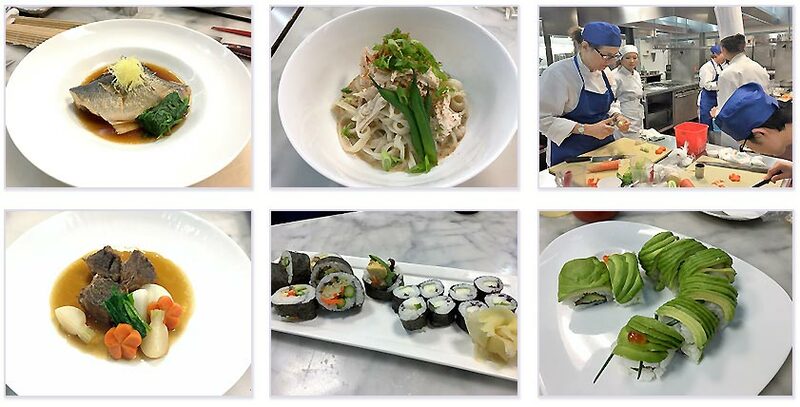 All of the classes Hiroko teaches at ICC are hands-on cooking classes. At her class you do not just learn ‘recipes’. Most importantly, you learn about the history, philosophy, preparation techniques, ingredients and food culture of Japanese cooking. With the knowledge gained at Hiroko’s classes you can easily reproduce acquired recipes in your own kitchen and apply what you have learned to your daily cooking. Hiroko considers ‘cooking at home’ to be one of the most important human activities. Cooking is like breathing air. It is a necessity. It is not a choice. Cooking is a responsibility and it sustains our health and mental wellbeing. Please join Hiroko’s cooking classes to learn one of today’s most admired and healthful cuisine, Japanese cooking. You will love the learning experience and the practical results of your new knowledge. Please find class information below. All of the classes are taught at International Culinary Center, New York City. This course is one week long, 5-hours each day, hands-on Japanese cooking course. Come and stay one week in New York as a learning experience holiday. During the day you immerse yourself in cooking and mastering Japanese cuisine: history, food culture, cooking philosophy, cooking techniques, dish preparation and more. In the evening you can enjoy eating out in a city known for diverse, excellent food. Hiroko, of course, gives you recommendations for ‘must-try’ Japanese restaurants. This New York unforgettable experience will become a lifelong memory. Click here to check out the detailed class content information. Sign up at www.internationalculinarycenter.com or call at 888-324-2433. This is a one day, 4-hour, hands-on class. Glean insight into the fascinating and delicious art of ramen, and learn from Hiroko how to prepare two popular styles – shoyu (soy sauce) and miso. Flavorful stock, ramen noodles, chashu pork and ramen eggs are on your training agenda. Finishing the class with a big bowl of delicious, hot ramen noodles that you have made is a huge reward for everyone. You will also learn how to make gyoza, tasty pork and Napa cabbage filled dumplings. Click here to check out the detailed class content information. This is a one day, 4-hour, hands-on class. In this introductory sushi class, you will learn the basics of making all types of makizushi (rolled sushi), including inside-out rolls. You will also learn the history of sushi, ideas for excellent sushi dining. You will master all the elements of sushi roll preparation you must know to make your own. You will also learn to make perfect sushi rice, pickled ginger, rolled omelet and a smoky dipping sauce.